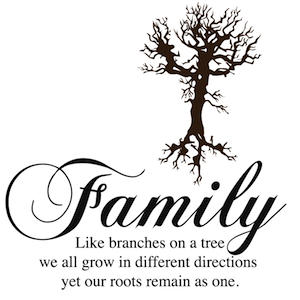 The Family Like Branches on a Tree is a beautiful, thought provoking design that will bring a wonderful depth to wherever you place it. Sizes are measured for the quote only "Assembled as shown". The tree is manufactured proportionate to the desired quote size. Use our vinyl wall quotes to express a little bit of your personality. All of our vinyl wall decals are made with the highest quality vinyl on the market. 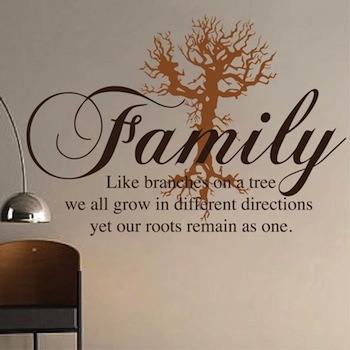 Our vinyl wall decals are removable therefore they are perfect for temporary or permanent decorating. Available in over 40 colors and varying sizes. Custom quotes and sizes are available. Contact us for more details. Make sure you have two people as it takes a little too ensure its adhering to the wall. Turned out very nice and it looks beautiful. Transformed the wall in less than 20 minutes. Bought this decal in the largest size for a hallway. It looks great! I love this wall design! It's beautiful on my wall. The only con is that I found it very hard to put up on my own. Definitely need an extra pair of hands.also I have an eggshell paint on my walls and it takes a little more pressing to get it to stick. I received my items very quickly and I would recommend this to anyone who wants to add something unique. I was looking for something unique and I came across this design. I absolutely love it! I placed it in our family room. It was fairly easy to install (following directions). I bought this in chocolate brown (tree) and olive (letters). I personally love the light and dark contrast. I would highly recommend this to everyone.